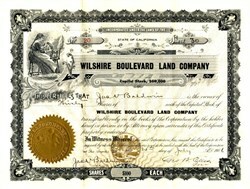 Beautifull RARE stock certificate from the Wilshire Boulevard Land Company issued no later than 1906. 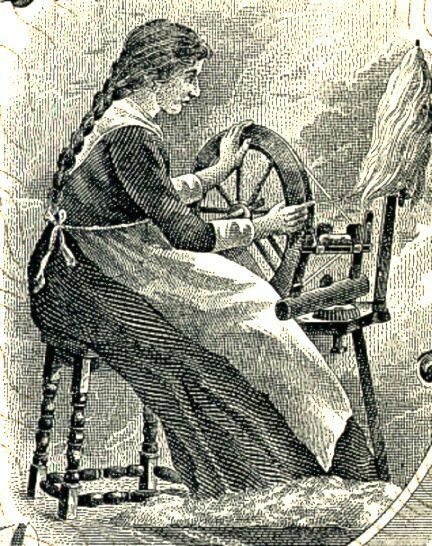 This historic document has an ornate border around it with a vignette of a woman threading her spinning wheel. This item has the signatures of the Company’s President, James V. Baldwin and Secretary, George B. Ellis and is over 105 years old. Issued to James V. Baldwin. Baldwin, James V., 536-8 H. W. Hellman Bldg., Los Angeles. California Savings Bank, Los Angeles. Glenwood Land Co., Los Angeles. Western Ave. Land Co., Los Angeles. Wilshire Boulevard Land Co., Los Angeles. Wilshire Land Co., Los Angeles. His best-known tracts are those in the West Adams and Wilshire Boulevard sections, and comprise the highest class of subdivisions, such as West Adams Heights, Westmoreland Heights, Wellington Place, Westminster Place, Larchmont Heights, Wilshire Hills, Wilshire Heights and many other similar properties in recently opened resi- dence sections. Mr. Baldwin was the first real estate operator to buy up acreage and start the improvement of subdivisions in the now exclusive Wilshire district, and he has been the largest realty operator in that portion of the city. His far-sightedness and belief in the city's future have caused him to reach out far beyond the generally supposed limits to which the city would expand for many years, and in almost every instance the growth has almost immediately caught up to him, confirming his judgment. It was this advanced judgment that has made him one of the foremost realty operators in Los Angeles. His prudence in choosing the' choicest districts for residence purposes has been a feature that has stood out in Mr. Baldwin's career. Mr. Baldwin is always found among the foremost men of Los Angeles, in his walk of life, in everything that pertains to the development, growth and welfare of a Greater Los Angeles. He watches with keenest interest the development of the Los Angeles Harbor, the Owens River project and other similar movements that have a local or national bearing on the welfare of Los Angeles. He has been identified with and is one of the leading spirits in the growth of the Los Angeles Realty Board. Mr. Baldwin is interested in a number of indus- trial and manufacturing projects and is a director in the California Savings Bank of Los Angeles. He is prominently associated with movements in Los Angeles in almost every branch of the business and financial world and by reason of his untiring work in any matter which he undertakes is re- garded as among the leaders in all the propositions intended to advance and upbuild the business or commercial interests of his adopted city. A man of genial personality, he is a conspicuous figure in the social life of Los Angeles and is one of the leading clubmen. He is a member of the California Club, of the Los Angeles Country Club and of the Jonathan Club of Los Angeles, and resides at the California Club.